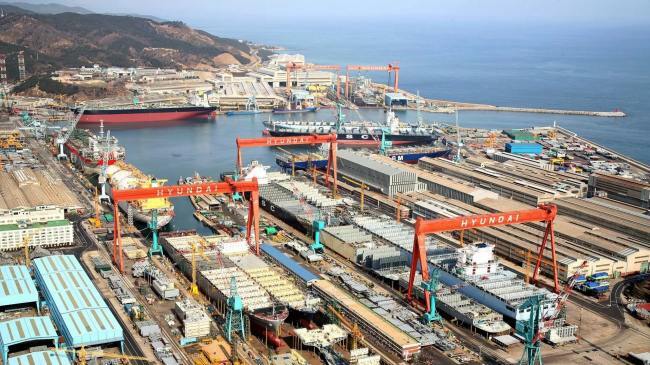 Hyundai Heavy Industries faces many obstacles to acquire state-funded Daewoo Shipbuilding & Marine Engineering as it has to win approval from around 30 nations, including its Asian rivals and European clients. When the world’s two biggest shipyards are merged, their combined market share will be 21 percent, and above all, the market share of liquefied natural gas carriers would reach 63 percent. As for LNG vessels, orders are likely to rise further from 2020 due to environmental regulations of the International Maritime Organization. The deal is subject to approval from antitrust regulators in multiple nations on concerns over monopoly issues. Industry watchers say rival nations like Japan and China as well as European clients may oppose the possible monopolistic move. Some governments in Asia and Europe have already expressed negative views on the tie-up. Andreas Mundt, president of Germany’s Federal Cartel Office, told Korean reporters on March 15, that a tie-up is “not a solution” to overcoming the crisis of companies from the market perspective, referring to the merger of the two shipbuilders. Korea’s Fair Trade Commission chief Kim Sang-jo, meanwhile, visited three European nations -- Germany, Belgium and Serbia -- two weeks ago to meet competition officials. Industry watchers said his visit was to persuade European officials to approve the government-led deal, although on the surface it was to share knowledge and views on competition policies.